Get "Google for Jobs - Ready"! Download the recording & learn how you should prepare for the launch of Google for Jobs in your country! The improved search feature from Google, Google for Jobs, provides an insightful job overview for job seekers who are using this search engine. The overview is (now) based on organic results, gathered from various sources. The new search experience has already been launched in several countries, like the United States, the United Kingdom and Spain. The question is not “if” but “when” Google for Jobs will be rolled out in the rest of Europe. One thing is certain: your job descriptions should be “Google for Jobs-ready”! 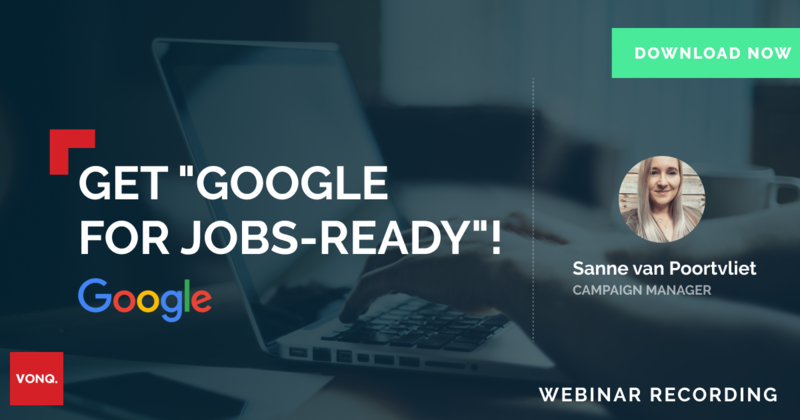 Download the recording of the webinar and learn all the essentials of Google for Jobs!